When I told the Pres I was heading outside to weed eat along the creek, he said he'd come out and help! YEAH!! So both the Pres and I cranked up our weed eaters and hit the patch all along the creek. It was done in no time. Before heading back to the house though I needed to get one brick from the pile that we have in back of the barn. I needed it to replace a broken one under the Pellet stove. Picking up the brick, I let out an "Ewww" when I saw a Black Ring Snake about six inches long curled up on the next brick. But the noise I made alerted my "handsome man", Copper, who came running. As Copper poked his nose toward it, that shiny, black, skinny reptile slithered in between the adjacent bricks, disappearing in an instant. I've learned that they're a "good snake" so we leave them alone. In fact, one year, one had taken up residency in my front garden bed, greeting me every day as I went to get the paper. The morning sun hit "his corner" and there was his shiny black head protruding from the hole, glistening in the sun's rays. I wonder what kind of snakes I'll find in the north east corner of Connecticut. Of course, I guess I need to focus on finding a house first and not what adventures await! P.S. No this is NOT my hand holding the reptile. This is merely an image provided by Google. I didn't see a picture.....but I understand...I wouldn't be holding one either. We now have two trimmers....have yet to get the helpmeet to pick it up and use it. Well I was glad to read that was not you holding that snake! Useful snake or not....if it lands on my property it's a dead snake. it is that time of the year even here in florida. i did take a picture of hubby holding one of these little guys yesterday, but he kept running out of the picture. Jake the Jaws, our hunter of all things slithering, caught 2 of these and one 3 foot black snake in the past 2 days and last week a 2 foot black snake. the first one we could not save the other 3 we did. the little guys are cute and we never bother them or the black racers. Whether they are good are bad, they are a surprise. It is always good to keep your snake eyes on, jump first, then indentify. 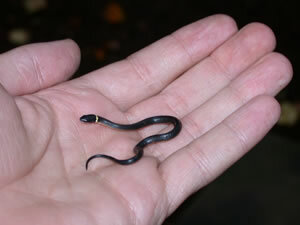 I had a small ground snake that kept scaring me in my heather garden. He was quite happy there, I did not like picking him up when I moved mulch or weeded. I finally relocated him. Totally fooled me - I thought that was your hand! I also thought you wre so brave holding that little snake. I couldn't. Not without embarrassing myself. I hope those who kill small and harmless snakes because they are on their properties will be over-run by mice, rats and other rodents. Snakes are useful critters and the small constrictor snakes will do no harm to humans. I've had a life long fear of snakes. In what;s left of my mind a good snake don't wiggle anymore. Ring-Necked Racers we called them. When the weather's a bit cool, they'll weave back and foerth between your fingers to soak up the warmth. It looks sort of like you're wearing a set of "iron knuckles." Them and the pretty little green snakes were always good to hide in your pocket and then pull out to scare girls and city-slickers. If you scare them, though, they'll "relieve themselves" on you or in your pocket. THAT'S an odor that doesn't go away easily! Good thing it's a "good"snake but I wouldn't hold it either! Good luck finding a house and all other adventures! I used to live in an apartment that I donned "the snake house". It was a brand new apartment and very pretty. My upstairs neighbor asked me one day if I had seen any snakes...I said "no" and he said..."you will". After that I started finding one here and there inside my apartment. One night after a long weekend of camping. I was exhausted and fell asleep in my comfy bed only to be startled by something crawling..or slithering over my shoulder. I flung it across the room and did not find it until the next morning. Then after a late night out with an out of town friend...I came home and when I opened the door...snakes went in every direction! There must have been 50 or more. Needless to say...I moved out the next day. We had to take fish tank nets to scoop up the snakes when I went back in to pack. Have to say I am not much of a snake holder! YUCK! ha! and here i thought you were...getting...braver!